A number of years ago, I was asked to write an article on “The Sin of Pride” for the British Psychological Society. Before writing that article, I knew very little about the topic. To me it was the title of an record album by The Undertones that I bought in 1983 when I was 16 years old from Castle Records in Loughborough. I perhaps learned a bit more about it when I watched 1995 film ‘Seven’ directed by David Fincher and starring Brad Pitt (which coincidentally just happens to be one of my all-time favourite films). After agreeing to write the article I did a bit of research on the subject (which admittedly meant I did a quick Google search followed by a more considered in-depth search on Google Scholar). While I’m no expert on the topic I can at least have a decent pub conversation about it if anyone is prepared to listen. Just to show my complete ignorance, I wasn’t even aware that the sin of pride was the sin of all sins (although I could in a pub quiz be relied upon to name the seven deadly sins). I was asked to write on this topic because I was seen as someone who is very proud of the work that I do (and for the record, I am). However, I have often realized that just because I am proud of things that I have done in my academic career it doesn’t necessarily mean others think in the same way. In fact, on some occasions I have been quite taken aback by others’ reactions to things that I have done for which I feel justifiably proud (but more of that later). At a very basic level, the sin of pride is rooted in a preoccupation with the self. However, in psychological terms, pride has been defined by Dr. Michael Lewis and colleagues in the International Journal of Behavioral Development as “a pleasant, sometimes exhilarating, emotion that results from a positive self-evaluation” and has been described by Dr. Jessica Tracy and her colleagues (in the journal Emotion) as one the three ‘self-conscious’ emotions known to have recognizable expressions (shame and embarrassment being the other two). From my reading of the psychological literature, it could perhaps be argued that pride has been regarded as having a more positive than negative quality, and (according to a paper in the Journal of Economic Psychology by my PhD supervisors – Professor Paul Webley and Professor Stephen Lea) is usually associated with achievement, high self-esteem and positive self-image – all of which are fundamental to my own thinking. My reading on the topic has also led to the conclusion that pride is sometimes viewed as an ‘intellectual’ or secondary emotion. In practical (and psychological) terms, sin is either a high sense of one’s personal status or ego, or the specific mostly positive emotion that is a product of praise or independent self-reflection. As I noted above, there have been times when I have been immensely proud of doing something only for friends and colleagues to be appalled. ‘Proper pride’ as Lea and Webley would argue. 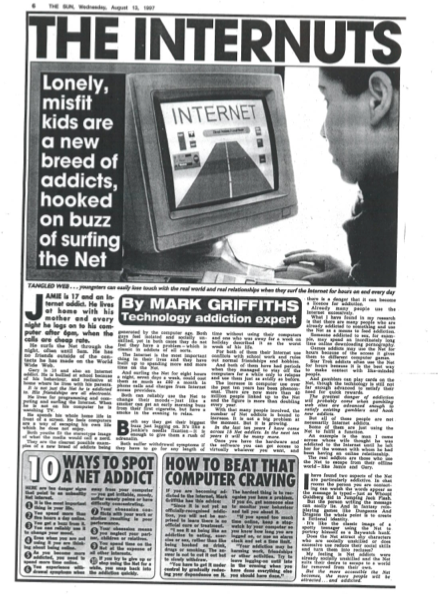 One notable instance was when I wrote a full-page article for The Sun on ‘internet addiction’ published in August 1997. I originally wanted to be a journalist before I became a psychologist, and my journalist friends had always said that to get a full-page ‘by line’ in the biggest selling newspaper in the UK was a real achievement. I was immensely proud – apart from the headline that a sub-editor had dubbed my piece ‘The Internuts’ – and showed the article to whoever was around. I had always passionately argued (and still do) that I want my research to be disseminated and read by as many people as possible. What was better than getting my work published in an outlet with (at the time) 10 million readers? My elation was short-lived. One close colleague and friend was very disparaging and asked how I could stoop so low as to “write for the bloody Sun?” Similar comments came from other colleagues and I have to admit that I was put off writing for the national tabloids for a number of years. (However, I am now back writing regularly for the national dailies and am strong enough to defend myself against the detractors). In 2006, I was invited to the House of Commons by the ex-Leader of the Conservative Party, Iain Duncan-Smith and invited to Chair his Centre For Social Justice Working Party on Gambling and write a report as part of the Conservative Party’s ‘Breakdown Britain’ initiative. Anyone who knows me will attest that my political leanings are left of centre and that I working with the Conservatives on this issue was not something I did without a lot of consideration. I came to the conclusion that gambling was indeed a political issue (rather than a party political issue) and if the Conservative Party saw this as an important issue, I felt duty bound to help given my research experience in the area. I spent a number of months working closely with Iain Duncan-Smith’s office and when the report was published I was again very proud of my achievement. However, as soon as the report came out I received disbelieving and/or snide emails asking how I could have “worked with the Conservatives”. I have spent years trying to put the psychosocial impact of gambling on the political agenda. If I am offered further opportunities by those with political clout, I won’t think twice about taking them. I am still immensely proud of such actions despite what others may think. Pride is ultimately a subjective experience and the two personal experiences that I outlined above will not put me off doing what I want to do. I shall continue to engage in activities where I think my work can have an impact and shall work with (and write for) those that can help me disseminate my research findings to as many people as possible. Averill, J.R. (1991). Intellectual emotions. In: C.D. Spielberger, I.G. Sarason, Z. Kulesar & G.L. van Heck (Eds. ), Stress and Emotion: Anger, Anxiety and Curiosity [Vol. 14] pp.3-16. New York: Hemisphere. Griffiths, M.D. (1997). The internuts (internet addiction). The Sun, August 13, p.6. Griffiths, M.D. (2007). Gambling addiction in the UK. In K. Gyngell (Ed. 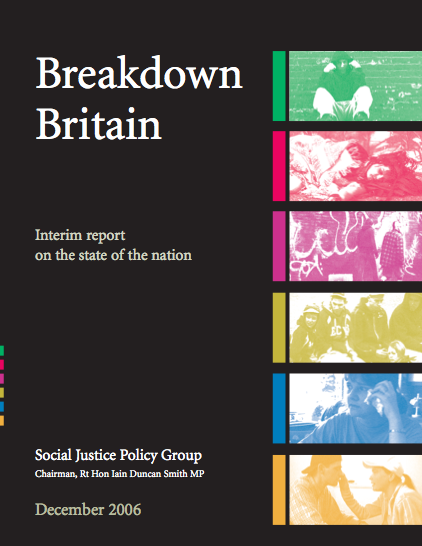 ), Breakdown Britain: Ending the Costs of Social Breakdown (pp.393-426). London: Social Justice Policy Group. Kemper, T.D. (1987). How many emotions are there? Wedding the social and autonomic components. American Journal of Sociology, 93, 263-289. Lawler, E.J. (1992). Affective attachments to nested groups: A choice-process theory. American Sociological Review, 57, 327-339. Lea, S.E.G. & Webley, P. (1997). Pride in economic psychology. Journal of Economic Psychology, 18, 323-340. Tracy, J.L., Robins, R.W. & Schriber, R.A. (2009). Development of a FACS-verified set of basic and self-conscious emotion expressions. Emotion, 9, 554-559.